Aghor Yoga is a “state of being” in union with wholeness. The Aghor state of being is experienced by illuminated beings of all great traditions. When established in the state of union with the wholeness, we see the oneness of all and non-discrimination becomes our first nature. The teachings of Aghor Yoga are deeply rooted in the ancient lineage of mystics from India. The essence of Aghor Yoga is that we as an individual are whole. Whenever we are in a state of separation, discrimination is a natural reaction of our mind. Then, we limit our wholeness and fall prey to anger, fear, jealousy, greed and lust. We end up investing a tremendous amount of energy in feeding these limitations. By identifying with our wholeness, when we are able to free ourselves from our limited way of being, the energy previously invested in our limitations becomes accessible to us and can be directed towards actions of greater good. Any concise effort that we make to connect with our wholeness is called Sadhana, a spiritual practice. A consistent effort that is in tune with our nature, simple to comprehend, and easy to practice, bears fruit. Our spiritual practice connects us with our fullness, and when we are full, it overflows. That overflow turns into seva, selfless service, in the community and world. 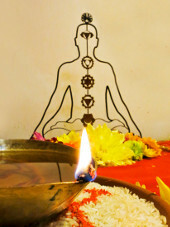 Sadhana and seva are the two aspects of the Aghor Yoga Path - like the two sides of the same coin. When left on our own to choose our spiritual practice, it becomes very difficult to settle on one practice. If we want to find water, it is necessary to dig one well deep. Left to our own devices, we end up digging many pot holes and never get to the water. This is where the Guru comes in. The very definition of the word Guru is remover of doubt. Free from doubt, when we begin to walk on a straight path, we reach our destination without much wandering around. Aghor Yoga is a Guru based tradition. The grace and guidance of the Guru enhances our spiritual growth. The Guru starts the practitioner on the path through initiation with a personal mantra. The Sonoma Ashram in Sonoma, CA, seat of Aghor Yoga in the United States, was founded in 1990 by Baba Harihar Ramji. The sole purpose of the Sonoma Ashram is to foster spiritual growth in an individual and provide ongoing support. One unique aspect of this path is that the Guru is always very accessible to the students. The Ashram provides a perfect environment for continuous growth in ones spiritual practice. The Sonoma Ashram’s sister Ashram, Bal Ashram, was established in 2001 on the bank of the Ganges in the holy city of Varanasi, India. Bal Ashram is a safe home for abandoned children and children without parents. Bal Ashram was created as a service project of the Sonoma Ashram. It is a perfect example of seva, the overflow of fullness. It is a special place where aspirants and friends can visit and share the overflow of their love with those who really need it.